A veteran actor and stand-up comedian, George Wallace got his start in entertainment as a writer for the Redd Foxx Show. His moonlighting work as a stand-up comedian helped him to cross over to film where he has co-starred in several motion pictures including Batman Forever, Little Nicky, A Rage In Harlem, Postcards from the Edge and several others. He is number 93 on Comedy Central's list of t he 100 Greatest Stand-Ups of All Time. In television, he boasts a number of guest-starring credits including Seinfeld, In The Heat Of The Night, Tall Hopes and The Fresh Prince Of Bel Air, just to name a few. Wallace, who was named the Best Male Standup Comedian during the 1995 American Comedy Awards, says that his routines are inspired by everyday moments of life. His unique brand of social commentary proved popular with radio audiences as well. Wallace was a regular on The Tom Joyner Morning Show before joining the legendary Isaac Hayes on a popular radio program on WRKS, New York. He also starred in his own HBO special and appeared on many television shows, such as The Tonight Show, The Oprah Winfrey Show and Late Night with David Letterman. 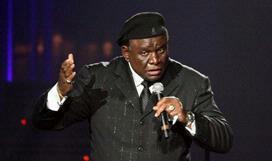 Vegastickets.com has a huge selection of George Wallace tickets, along with all the Las Vegas headliners, shows and concerts. At Vegas Tickets you can count on finding George Wallace Tickets and tickets to all the Las Vegas Shows and Las Vegas Concerts. We are a local Las Vegas ticket broker with a local office located just minutes from the world famous strip. Vegas Tickets is a long-standing member of the NATB (National Association of Ticket Brokers), ASTA (American Society of Travel Agents), and the Las Vegas Chamber of Commerce. We have Celine Dion tickets and all the Cirque du Soleil Vegas tickets. If you can’t find what you’re looking for on our website, please call one of our professional sales reps at 877-467-4697 and we will do our best to help you.